Done well, email personalization cements the relationship between consumer and brand. Performed poorly, perhaps nothing drives a bigger wedge between the two. The good news: Organizations are willing to invest in email and related tools given its proven ROI, $38 for every $1 spent, according to VB Insight's research. The more points of contact you can correctly personalize, the stronger the bond, and those organizations pushing beyond dynamic field insertion (e.g., "Dear Jane") stand to reap the highest rewards from engagement, loyalty, and spending. 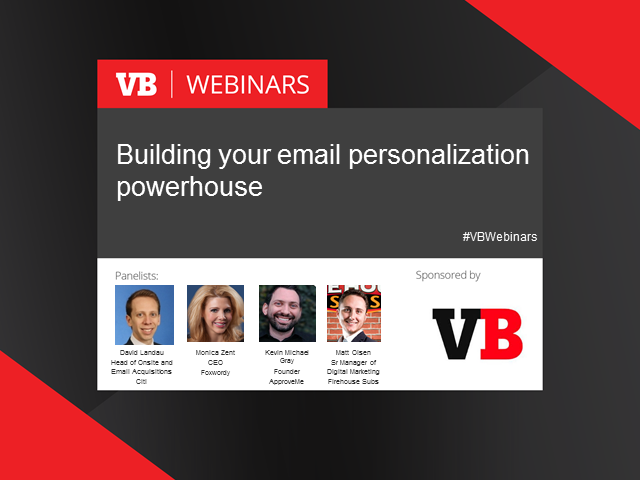 Join VentureBeat Insight at 10 a.m. Pacific / 1 p.m. Eastern on Wednesday, February 17 for a live interactive exec roundtable "Becoming an email personalization powerhouse." Sign up now and you'll get a reminder – personalized, of course. This webinar will be based on our VB Insight email marketing personalization report, published in December 2015.